In June, New York City-based Pfizer raised the price of Viagra by 13 percent. Just days later, Indianapolis-based Eli Lilly followed suit, increasing the price of Cialis by the same amount, reports The Wall Street Journal. Holy Crap! BCBS announces $50,000 sales incentive bonus on each new fully insured group sold! Why sell anything else? Case of the Singing Canary? Will Haff, a San Antonio insurance consultant, has had his sentencing postponed a second time (Consultant Sentencing Delayed Again – Now 30 November 2016).Sentencing is now set for February 1, 2017. If prices rise more than an agreed upon rate, excess increases may be offset by additional rebates. For some employers this means the PBM is pocketing some or all of the rebate money, driving record profits. In these cases there is absolutely no incentive on the part of the PBM to lower Rx costs. Rather, they earn more kickbacks as drug costs escalate. This revenue sharing between the PBMs and manufacturers at the expense of consumers continues to fuel spiraling Rx costs. Are Health Systems Improving Price Transparency? After Healthcare’s “Katrina”, Who Wins/Loses? Healthcare stole the American Dream. But I’m excited to tell you a story about how forward-looking citizens, nurses and doctors are taking it back by fixing healthcare. And it’s working. MEC Plans – A Tax Dodge Whose Time Has Come & Gone? Minimal Essential Coverage (MEC) plans are simply a tax dodge utilized by employers seeking to minimize the Affordable Care Act’s punishing mandates. By offering a MEC plan with essentially no benefits other than coverage for preventative care an employer can avoid the $2000 per year fine for every full time employee (minus the first 30). “Hospital occupancy across the United States is about 65 percent,” said Dr. Cosgrove. Good news is a pretty rare thing when discussing health care costs in the US. In fact, good news has been a rare thing overall this year. This is why I was rather shocked to discover very good news in the last place I would ever expect to find it: prescription medication prices. One in three Americans, more than 113 million medical records were compromised in 2015. 2016 statistics show the trend will be worse, with one in four Americans affected. Tired to seeing your claim costs escalating, year after year despite representations from managed care intermediaries that cost saving “discounts” are ever increasing and have never been higher? And, you should thank PPO’s for saving you 50% or more off health care costs. But, RiskManagers.us has now proven to your satisfaction the real truth behind ever increasing health care costs. You are finally ready to jump off the cliff into what you perceive as shark infested waters with the assurance you will (1) survive, (2) the sharks are more afraid of you than you are of them and (3) the cleansing currents will take you to an island paradise where health care costs are fair, reasonable, predictable and essentially static. Umbrella drinks abound. Claims she would revolutionize the blood-testing industry with her patented Edison machine, a device that she said could conduct diagnostic tests with a single pinprick………………. Hello Again Everyone! You might remember that, last Summer, I wrote a blog that questioned United Health’s claim that they lost hundreds of millions of dollars on the ACA exchanges last year. In short, I used their own financial statements to show that their profits, revenues and madical loss ratios didn’t square with their claims very well. While in the Houston Heights over Veterans Day weekend, I took my daily walk through the Heights. As I turned to go down Courtlandt Street, I noticed a “garage sale” ahead with a small crowd around a table. As I got closer, I saw this was something extraordinary. It was not a garage sale, but something very different. And, it turned out, something very special. The old man continued, “I have quite a few things I have kept since the war that I want you to have. I think this will be a good home for them……………………. Dozens of companies have received a letter, via their insurance administrators, asking them to waive their rights to sue……. . If they don’t, a fact sheet included in the letter says, the companies’ employees will no longer have access to discounted in-network prices………..……..
Wonder what ADA leadership thinks of Trump? DALLAS, TEXAS, November 11, 2016 – HealthSmart, a leading independent provider of managed care solutions for self–funded employers across the country, today announced that Phil Christianson has been named the Company’s new President and Chief Executive Officer, succeeding Tom Kelly, who has resigned from the Company to pursue other interests. We Collectively lost 15.2 Lbs! “Hospitals agreed to assess a fee on themselves for every outpatient served and put that money into a fund that is then sent to the federal government to be multiplied.” TRANSLATION: Hospitals inflate medical charges to consumers, put these additional inflated dollars into a fund that Uncle Sam will match with money taken from working men and women through forced taxation. Consumers are charged twice, once in the form of onerous taxation and second when they seek medical care. “Many opponents believe the district would mostly benefit the shareholders at Doctors Hospital at Renaissance. The physician-owned hospital is one of the biggest supporters of Proposition 1.” TRANSLATION: Hospital can’t lose. They fund through overcharging patients which Uncle Sam matches, then these funds which are now double return back to the hospitals in the form of patient revenue. Editor’s Note: We have found PBM pricing at CVS to be some of the highest, along with Wallgreen’s pricing. Some of our clients have excluded both pharmacy chains from their network and have achieved plan cost reductions. A “psychic” billy goat from Scotland named Boots chose a piece of paper that had Clinton’s name on it, thus predicting her victory. A “mystical” Chinese monkey named Geda, who often predicts the winners of European soccer games, chose Trump as the winner of the U.S. election by choosing a banana near a cardboard cutout of the GOP candidate. 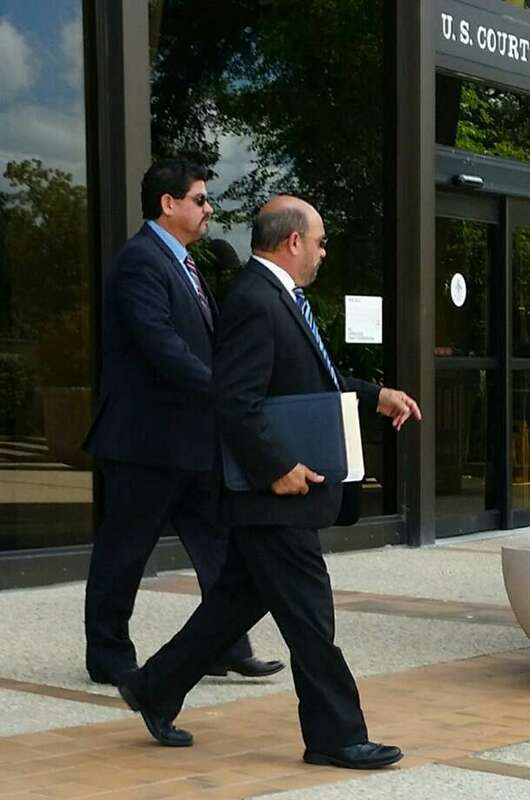 Samuel Mullen, (left), walking out of federal court today in San Antonio with his lawyer, David R. Gorena (right) admitted Tuesday that he bribed a consultant for area school districts for inside information to help win insurance contracts. Wikileaks today has released Part One of Mulebriar’s exclusive interview with Julian Assange. The interview was held at the Ecuador embassy in London on Monday. Wikileaks will release the first installment of Assange’s interview with Molly Mulebriar sometime later this afternoon or tomorrow morning. Julian Assange, founder of Wikileaks, says the release will rock the managed care industry.